Dental cavities can strike at any age. Unfortunately, dental cavities can't repair themselves and can lead to severe oral health problems if left untreated. Thankfully, restorative dentistry treatments are available to repair the damage caused by dental cavities, improving oral health and restoring the beauty of your smile. To find out which treatment for cavities is right for you, schedule a consultation with Plymouth, NH dentist Joan Kirschner. Tooth-colored fillings: Tooth-colored fillings are one of the most aesthetically pleasing options. Tooth-colored fillings are made of a composite resin, which is matched to the same color as the surrounding tooth for a seamless finish. Tooth-colored fillings may even be used to replace old metal fillings, restoring the smile's appearance. Metal fillings: Although less aesthetically pleasing than tooth-colored fillings, traditional metal fillings are still an option for dental cavities. Metal fillings may be made of silver amalgam or gold. Inlays: Inlays are another option for cavities and decay. Inlays are custom-made of porcelain, which can be colored the match the shade of the natural teeth. Inlays are used to treat dental damage within the cusps of the molars. Onlays: Onlays are similar to inlays and may be used to treat decay and cavities, but may also be used to treat other forms of dental damage. Onlays provide more coverage than inlays, which is why they are sometimes called “partial crowns.” Onlays are often beneficial for restoring dental health when damage is too severe for a dental filling but not severe enough for a dental crown. 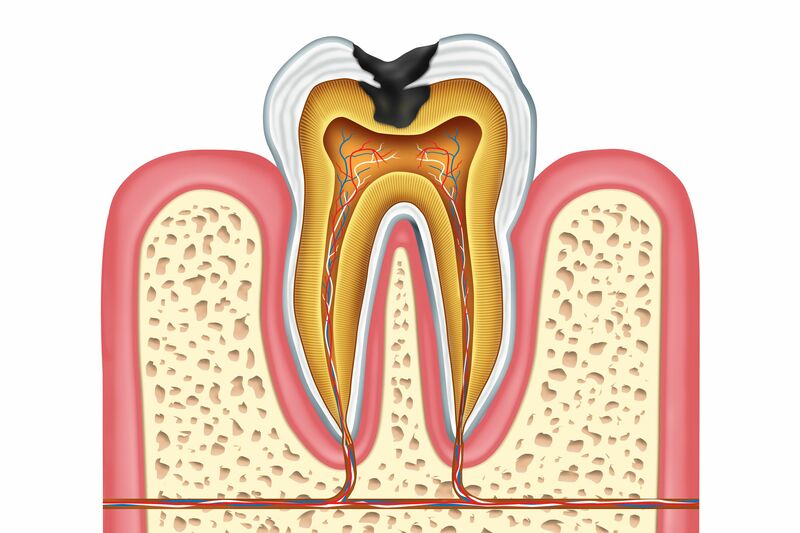 Dental crowns: Porcelain dental crowns are custom-made restorations that fit completely over damaged teeth, making dental crowns a great option for those who suffer from severe dental damage or require large fillings. Dental cavities are most often caused by plaque and tartar buildup, which can be prevented by practicing good oral hygiene habits. Follow these tips to reduce your risk of developing dental cavities. You can enjoy restored oral health with treatment from Dr. Kirschner. To learn more about your treatment options, we welcome you to schedule a consultation.